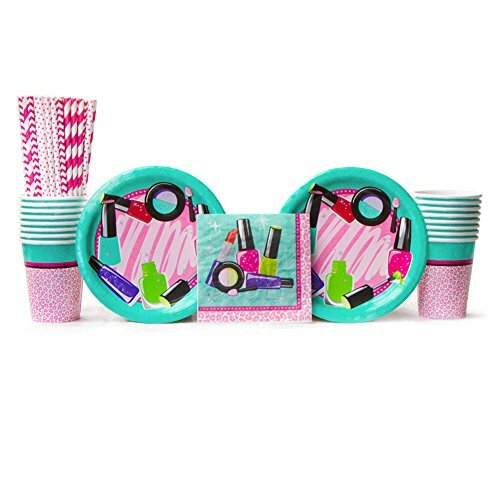 This Sparkle Spa Party Supplies Pack offers everything you need for a girl's glamorous birthday party! These decorations make the perfect salon atmosphere as your guests get pampered at their own little spa. Accommodates up to 16 people. Pack includes 16 dinner plates, 16 paper cups, 16 luncheon napkins, and 24 Cedar Crate Market brand straws made of non-toxic, BPA free, and elemental chlorine free materials. Strong and durable for lasting fun and enjoyment! Straws made in the USA! 24 Cedar Crate Market Brand Paper Straws in Stripes, Chevron and Dots Design, 7.75"
If you have any questions about this product by Cedar Crate Market, contact us by completing and submitting the form below. If you are looking for a specif part number, please include it with your message.